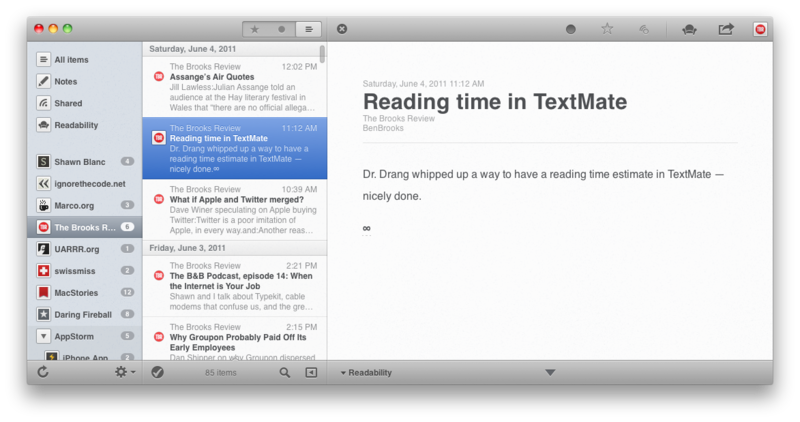 I’ve tried several RSS Readers for Mac. Many of them are free… such as Google Reader, or Capuccino. But a couple weeks ago i sumbled upon Reeder. I dare to say… it’s the best RSS Reader you’ll be able to find, anywhere else. Reeder has several UI styles. Personally, i use the layout portraited above. You get your feed list on the left… the posts in the middle, and the actual post on the right. Now here’s something interesting. If you click over a post, the app hides the Feed List, and automatically enhances the post itself. Reeder has also something super cool. It’s Gestures-Enabled, which means that you can just swipe to the left or right, and trigger several actions (of course, you can configure that). Most important of all… you can connect Reeder to your Google Reader account, and that’s it, this guy is gonna keep everything in sync. You could run it across several OSX installations, and… everything will be in sync. I know it ** might ** be a bit expensive, for a simple rss reader. But trust me, this ain’t no simple reader.. and i believe it’s totally worth it!. Previous PostAdding Adsense to your blogNext PostMake your Website load Faster!